The correct title of this article is about:config. It appears incorrectly here due to technical limitations in the wiki software. about:config is a feature of Mozilla applications which lists application settings (known as preferences) that are read from the profile files prefs.js and user.js, and from application defaults. Many of these preferences are not present in the Options or Preferences dialog. Using about:config is one of several methods of modifying preferences and adding other "hidden" ones. This article is a companion article for about:config entries where the most important about:config variables are described. Warning: Modifying preferences can, in rare circumstances, break Firefox, Thunderbird or the Mozilla Suite, or can cause strange behavior. Only do so if you know what you are doing or are following trustworthy advice. 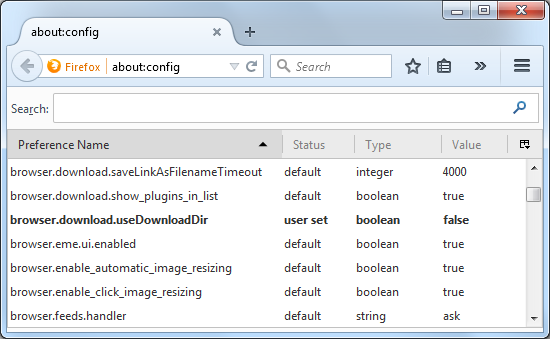 In Firefox and SeaMonkey, type about:config in the Location Bar (address bar) and press Enter to display the list of preferences, as shown below in Firefox on Windows 7. If you see a page with the warning message, This might void your warranty!, click the button labeled "I accept the risk" or "I'll be careful, I promise!" to continue. (In fact, there is no warranty whatsoever, it's more a joke to ensure that users are aware of what they are about to do.) Use the checkbox there to avoid the warning in the future. In Thunderbird, about:config is accessed via "Tools -> Options -> Advanced -> General -> Config Editor (button)". To access this and other about:* functions more easily in Thunderbird, you can use ViewAbout add-on. To add a new preference, context-click (right-click) anywhere in the list of preferences. In the context menu, select New then select the type of preference you are adding. To modify an existing preference, context-click (right-click) on the preference. 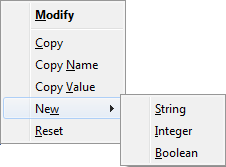 For string or integer preferences, select Modify in the context menu and type in the new value. For boolean (true-false) preferences, Toggle will be the selection offered. To reset a preference to its default value or to remove an added preference, context-click (right-click) on the preference and select Reset. If you added the entry via about:config, the preference will no longer be listed after restarting the program. (For more information about resetting preferences, see this article). You can use the "Search" bar at the top of the about:config page ("Filter" bar in older versions) to filter the preferences that you want to inspect. The search bar is case-insensitive, unlike the actual configuration variables. Regular Expressions: Starting with Firefox 3, the Filter bar also accepts wildcards and a regular expression in the form of /regexp/i to filter preferences. The i switch is for ignore case. That is the default for normal searches, but you need to specify it if you want the RegExp match to be case insensitive. The RegExp tests for a match of name;value of a preference. About protocol links — other about: pages.